Early Saturday morning (and when I say early, I mean really early – 4.10am!!) I was interviewed for the ABC Overnights program about Technology in the classroom. It was an interesting 45 minutes spent with Sally Knight discussing all manner of things related to how classrooms and student learning environments have changed with the introduction of computers. If you’re interested in listening to how it all went, take a listen via the player below. Surprisingly, two people I know have contacted me to say they heard me speaking on the radio. Fascinating that people are tuned in at that time of the morning! Well, this was my first visit to sunny (and very warm for this time of year!) Brisbane for the EduTECH National Congress. Who wouldn’t be excited to have been asked to present when you’re sharing the space with the likes of Sir Ken Robinson, Conrad Wolfram and Sugata Mitra? I was excited, but I have to say nervous too, especially when I discovered after registering on the afternoon before the event that I was presenting in the Great Hall. Honestly, I hadn’t looked at the program all that closely other than to know the time I was presenting, so it was rather daunting to discover that my session was in a venue larger than any stage I’d presented on in the past. My Keynote was “Digital Literacy: guiding students (and teachers) to develop their 21st century skills.” I tried very hard to take much of my own experience and apply it to this presentation. For years I was focused on my own classroom and as Head of Library, at the knowledge base of the classrooms I was able to influence. In my position now as Director of ICT and eLearning, it’s my job to make possible large scale change across the school campus. It’s a different proposition, because in a position like this you make decisions about the operation of the school network and the platforms that are used. 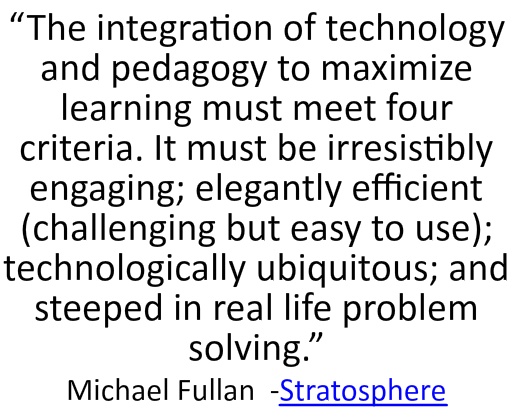 I do a lot of reading to support my understanding of change and what is needed to make meaningful impact, and Michael Fullan’s Stratopshere had a passage that had staying power for me. Over the last 18 months, I’ve had this at the forefront of my thinking. It’s relatively easy to get the early adopters accepting new platforms and running with them, but a much harder proposition to get the late majority and laggards coming with you. You need to try to fulfill Michael’s criteria and think hard about what you need to do to make technology available so that it sits in the background making things possible, but not being a learning outcome in itself. As I said in the presentation, technology should not be an event in the classroom, it should act as a facilitator for effective learning outcomes. My presentation is available to view in my wiki, you just need to sign in with an email to gain access. I’ll let you take a look and make your own judgement about it’s effectiveness. I was overwhelmed from the response it got on Twitter – I couldn’t keep up with the stream in the 30- 45 minutes after I left the stage. To be honest, it was validating. So much of the time I’ve voluntarily invested in networks was represented in that presentation. It felt like a hell of a lot of thinking and hard work had paid off. I attended the conference dinner where we were once again entertained and enlightened by Sir Ken. 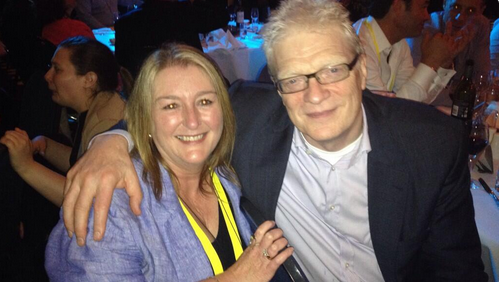 And yes, I behaved like an edu-groupie and managed to get a photo taken with him. No longer a lame claim to fame! If you’ve never visited the Wolfram Alpha site, you must take a visit. Then take a look at Conrad’s site where he makes the case for change to the way we teach Maths today (see video below – appears on this site). 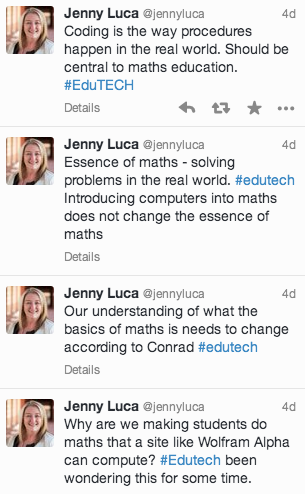 I’m not a Maths teacher, but I have a son finding it very difficult to access the Math curriculum as it stands now. 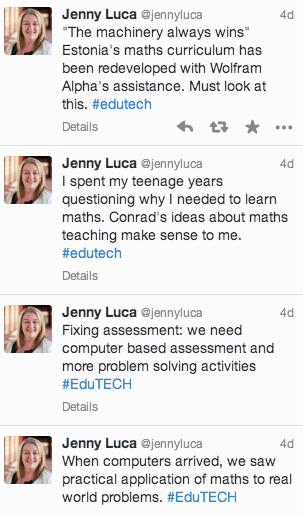 Conrad’s ideas sound like Project Based Learning (PBL) for Maths, and it makes sense to me. I thought Greg Whitby had some practical and important things to say about making change happen as did Matt Richards who didn’t hold back when presenting to IT Managers about moving your school into the cloud computing space. Judy O’Connell has a wealth of knowledge and did a great job informing the audience about what is necessary to prepare for the impact of Web 3.0. Visit Judy’s blog where her presentation is embedded for viewing. Special mention needs to go to Matt Esterman who got the ball rolling for Teachmeet presentations that happened at four different times in the main Trade Hall where an area had been set aside for them. It was wonderful to see classroom practitioners sharing their practice with conference participants and opening their eyes to the vibrant education community being forged in informal networks throughout Australia today. Thank you to the organisers of the event for bringing together such an interesting array of speakers and for managing to draw such large numbers to an event about educational technology. Thanks also for giving me an opportunity to air my thinking. Like I said, a validating experience. It’s been a HUGE week for me, but not nearly as huge as the week that John Green has had with the release today of ‘The Fault in our Stars‘ worldwide. I find John absolutely fascinating. He’s not only fascinating, he’s entirely relevant to the subject I teach, ‘Language of our Times’. This Year 9 elective is designed to help students understand the nature of communication in today’s world. My students are currently completing a task that required them to work collaboratively to research John’s use of social media channels to grow his audience. The second part of the task then required them to individually produce a feature article about John’s methods that could appear in a digital newspaper. They need to think about the headline, lead and the structure of the paragraphs to follow. As they write, they needed to hyperlink to relevant content and find suitable pictures and YouTube videos that would complement the written text. What I’ve seen them produce so far has been fantastic. I’m pretty blown away by the skills some of them have to write with the kind of conversational tone that works well in a feature article where your subject matter is someone who uses the Internet to good effect like John Green does. Why was my week huge? 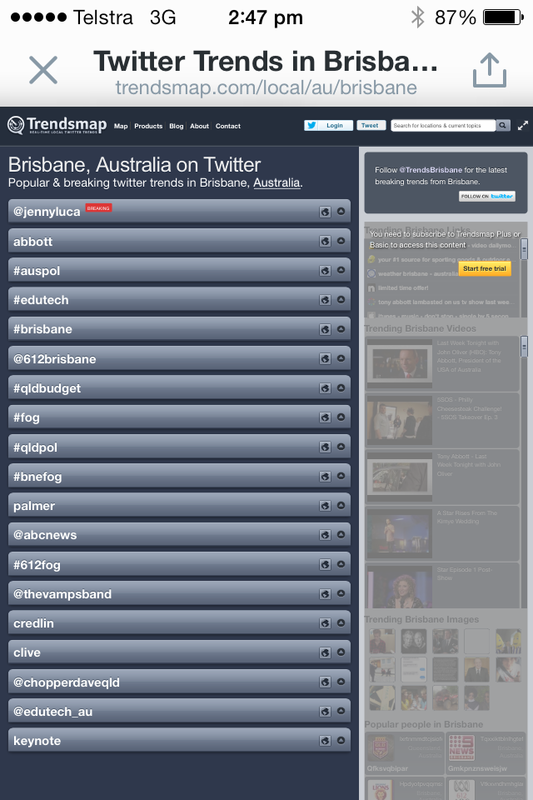 Well, I presented at EduTECH in Brisbane. I’ll write a post over the weekend that explores what happened there. I’ll leave you with this though.